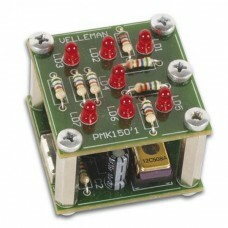 The LED Shaking Dice Kit is used to build an electronic die that rolls when shaken. Roll the dice by shaking this kit. The Shaking Dice will light up a random combination of LEDs from 1 to 6 when shaken. LEDs blink in an animated rolling fashion and then stop at a random value. Use it to play games like any other die. This kit features a preprogrammed microcontroller and will automatically power off when not in use. This is a electronic kit that requires basic soldering skills. A 3V CR2025 or CR2032 coin battery is required.